Finally a vinyl version of the Best Metal Album EVER! I'm 25 and am probably one of the last people who grew up as a kid in the late 80's and very early 90's listening to my parents vinyl records. The resurgence of vinyl is a dream come true, and now the best Metal album ever recorded is now available in this format with all its nuances. Absolutely stunning to listen to! However, there are a couple points I need to make. 'Master of Puppets' really pushes the 33 1/3 RPM LP format to its absolute limit. Side One runs 26:48 in length while Side Two runs 27:10 in length, very, very close to the absolute maximum limit of 30 minutes of playing time per side possible on an LP. Because of that, the playing volume suffers somewhat. Don't expect to put this record on your tabletop record player and speaker system and expect to be blasted out of your shoes. You really should have a serious hi-fi rig with large speakers and high quality receiver amplifier if you want to really rock the house with this record. This is not dissing this album in anyway, I'm just pointing out a limitation of the LP format that putting this album in it brings forth. Maybe the best Metallica album? Geez, this is my first Amazon review in a while, so looks like I have some catching up to do. INTRODUCTION: In the 1980's, the 2nd greatest metal group Metallica had formed. The members were James Hetfield on Lead vocals and guitar, Kirk Hammett on Guitar, Cliff Burton on Bass, and Lars Ulrich on drums. This is the last album to feature Cliff Burton (R.I.P.). 1. BATTERY- 10/10- A great intro, begins with Flememco guitars, and leads into a pulsepounding Metal epic. My 2nd favorite song they made. 2. MASTER OF PUPPETS- 10/10- The best song ever! Great guitars, and awesome lyrics about drug abuse. One of the coolest guitar solos. 3. THE THING THAT SHOULD NOT BE- 10/10- Great song! I can't get over it! I like the dreary mood of this song. 4. WELCOME HOME (Sanitarium)- 10/10- Awesome! Can't say more. 5. DISPOSEABLE HEROES- 10/10- Catchy fast paced song. 6. LEPER MESSIAH- 10/10- One of the best songs ever! So thrashy and catchy. 7. ORION- 10/10- The best instrumental ever. Turns different halfway, which is why I love it! 8. DAMAGE INC.- 10/10- Great ending to the album! Why did St. Anger steal the chorus? One of the Greatest Old School Metal CDs! I recently got into Metallica the past few weeks (their old stuff anyway). Ride the Lightning was the first CD I got. After being blown away by it, I didn't possibly think it could get better. I had always heard that MOP was their greatest moment, so I was Excited to recieve it. I thought RTL was going to be my favorite, but wow I was wrong. This is now one of my favorite metal CDs ever. There isn't one dull moment on this CD. Battery 10/10: This track starts out slow, but then the metal punches you in the stomach and your left breathless. Wow, one hell of an album opener (kind of similar to RTL's Fight Fire With Fire). This song deals with aggression. 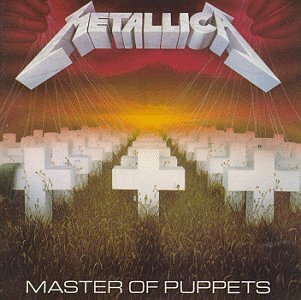 Master of Puppets 10/10: This is my personal favorite on the album. This song has the catchiest chorus and a slow, yet beautiful balled section in the middle. This song deals with drug addiction. The Thing That Should Not Be 8/10: A lot of people bash this song. It is the weakest song on the album, but compared on its own, it's a metal masterpiece. Welcome Home 9/10: This is the album's balled (still pretty heavy though). It deals with a mental patiant's struggle in an institution. The lyrics shine hear. Disposable Heroes 10/10: This song is very underrated. This is one of the highlights on the album, imo. It deals with soldiers' strain in battle. The lyrics are perfect, and the chorus is catchy and heavy. Leper Messiah 9/10: Another underrated song. Some say it's the weak point (but some like me disagree, I still say The Thing That Should Not Be is) on the album. It deals with priests collection contributions to earn a higher seat. Orion 10/10: Wow. This is probably Metallica's best instrumental. The Call of the Ktulu was great, but often repetetive. Not this one. This one is interesting the first half, and then changes style and continues to sound even more interesting as it goes along. I'm not sure what it's about, but can guess that it's about outer space. Damage Inc. 9.5/10: Great. Probably Metallica's best album closure. One hell of a closure. After the long and beautiful Orion, people are in a trance of a pretty melody in the first minute. But then the song takes off without expectancy and is over and done before you realize what just happened. The song is pretty much about what the title says. On March 3rd 1986, Master of Puppets was released and it became Metallica's 3rd, best, and the last with the bassist Cliff Burton before his death in September 1986. This is probably James Hetfield's best vocals on this LP. Kirk Hammett may have been played better lead guitar on Metallica's other albums but he still does an excellent job on this LP, man that guy can play guitar. He is just as good as Jimi Hendrix, Jimmy Page, and David Gilmour. This is a thrash metal classic and this has Battery, Master of Puppets, and my favorite instrumental Orion. Orion was the first instrumental song I have ever heard by any band and is better than The Call of Ktulu and though that was great too. Lars Ulrich does his best drumming on Orion. The title song has a great beautiful ballad style in the fourth minute of the song is what they would call it Maestro down in Mexico and South America. The LP starts out with Battery with a slow Spanish style acoustic guitar intro which was better than Fight Fire with Fire. This is also known as better than their previous record Ride the Lightning which was really great too. Welcome Home (Sanitarium) is a great ballad too, and though Fade to Black was a lot better. The Thing That Should Not Be is probably the slowest song on the LP and For Whom the Bell Tolls was a lot much better. Even though there is a F word on this LP it is still really awesome and is probably my favorite heavy metal record of the 80's. Simply put, this is metal at its finest by arguably the greatest metal band in their heyday. Besides playing host to the ubiquitous "Battery" and the titular track "Master of Puppets," the album contains "Sanitarium" and "The Thing That Should Not Be," two other great tracks. The rest of the album is solid, including the instrumental track "Orion." on this cd are the great songs "Welcome Home (Sanitarium)" and "Orion", 2 of the best songs in the history of Metal, great riffs, great rhythms, great melodies. the rest of the songs are apart from some nice parts here or there average, nothing special. if you want a cd full of fast metal then this isn't the right cd for you, buy "Reign In Blood" from Slayer instead! Thrash metal? More like TRASH metal! Get St. Anger instead. I don't know why people think this is Metallica's greatest album! It's the same riff over and over and over and over, and I have not even seen a MOP music video on MTV. Like seriously, where's the variety, like in St. Anger? I'm writing this review 17 years after this record was released and I'm writing with the same admiration and awe as when I first heard it. It has not gotten old or stale and if anything I appreciate it even more given the current sad state of affairs in the music buisness. This is a seminal hard rock/metal milestone. It ranks with the very best of the genre; including Black Sabbath's "Paranoid", Nirvana's "Nevermind", Guns N Rose's "Appetite for Destruction", AC/DC's "Back in Black" and Led Zeppelin 4. It is a near flawless example of metal fused with melody and compelling song writing and musicianship. "Listen, dammit, we will win!" Despite my decidedly non-metal oriented tastes, I'm a pretty big fan of Metallica. Especially this album, a pure masterpiece, Metallica's greatest album ever. Ride the Lightning is also an excellent album, but I'm not a big fan of "Escape." By contrast, I can think of NOTHING to complain about here. Wall-to-wall, ceiling-to-floor, every song is very close to perfect. Choosing highlights on this album is hard, but one that especially stands out to me is "Welcome Home (Sanitarium)." I've always loved Metallica's power ballads, and this is arguably the best of them. It's my favorite Metallica song after "Fade to Black," a haunting song undercut with strong emotions of anger and confusion. Also great on this album (I mean, besides everything) are the three extended epics on this thing. The title track and "Disposable Heroes" both speed through piles of brilliant riffs with surprisingly great melodies. The title track is a just classic, one of Metallica's greatest songs ever, but for some reason "Disposable Heroes" gets something of a bad rap. But it's amazing as the title track, with just as many spectacular riffs. And the instrumental "Orion" is even better than the previous album's "Call of Ktulu," which was a classic to begin with. Not bad! Ah, and those other four songs score big points, too. "Battery," "Damage Inc.," and "Leper Messiah" all really work as fast, angry thrashers - I especially enjoy "Leper Messiah's" anti-Televangelist lyrics. And the Lovecraft-inspired "Thing That Should Not Be" is quite an eerie song, between its lyrics and the sound effects. Some have complained that Master of Puppets borrows the sequencing from Ride the Lightning, and I can see that. Both albums open with a deceptive acoustic introduction that gives way to a powerful thrasher, move into a complex title track, which becomes a doomy, sound-effect laden song and, lastly, a power ballad. The second side contains three thrashers and one epic instrumental, though the instrumental here is second-to-last rather than last. But I think they PERFECT that formula here, so no complaints! I'm just starting to visit some of Metallica's older work and thus far I'm impressed. One thing that struck me when listening to this album was how much more interesting Metallica was than many of their peers from this era. While other bands were writing sweaty paens to the female anatomy and the travails of being on the road, Metallica was tackling such heavy subject matter as substance abuse ("Master of Puppets"), mental illness ("Welcome Home (Sanitarium)"), assembly line war ("Disposable Heroes"), and dangers of evangelism ("Leper Messiah"), all book-ended by two heavy shout along numbers, "Battery" and "Damage, Inc". There's even a foray into sci-fi/horror territory with "The Thing That Should Not Be" and a complex instrumental in the form of "Orion". While I grew up in the 70s on bands like Deep Purple, Black Sabbath, Rush, and Rainbow, I moved away from hard rock and metal to classical music late in high school. I only recently discovered Metallica when XM set up a temporary station called "Mandatory Metallica" which broadcast in March and April of 2009. I listened to a lot of their stuff one weekend and liked them enough to order this album from Amazon. Overall, I think Master of Puppets is a great album. While the thrash guitar and fast drumming make it very intense, the band also delivers good melody and some very fine instrumental interludes; I especially like the use of acoustic guitars in some of these. I also give the album high marks for providing a fresh sound different from previous metal records and for its thoughtful lyrics. Metallica's final album with Cliff Burton is also their best. September 27, 1986 remains one of the bleakest days in metal history. Metallica lost their bassist and creative driving force in Cliff Burton. Though the band would continue to write some decent albums, they were never the same band without him. After his death, the band put out ...And Justice For All which to date remains their exploration into progressive metal territories. Though the album is highly regarded among both metal fans and music fans alike, many called the production into question and felt it took away from the powerful nature of those songs. The band abandoned that sound after supporting the album and started to resemble a metal band again nearly 20 years after ...AJFA's release. This album, on the other hand, is highly revered by most of their fans and has not only withstood the test of time but may have actually gained more popularity as time has rolled on. I'll tell you I've owned two copies of this album and now have it committed to digital format, which rules. Master of Puppets- The speedy riffs and beautiful interlude make this song one of the best. The Thing That Should Not Be- one of the more less appreciated songs on this album, but it is the heaviest song by far in Metallica's first three albums. This song's lyrics are some of the best too, considering it is about HP Lovecraft's At the Mountains of Madness. Read that story and you will love this song even more. Welcome Home (Sanitarium)- This song has it all... good lyrics, riffs, solos, and that catchyness that even not metal fans can enjoy. Orion- Cliff's musical knowledge and ability comes out in this song. The interlude and bass solo are sweet music to my ears. An absolute classic, but it certainly needs remastering ! I won't get into how fabulous and awesome this album is, enough people have done that already. Let me just say that this album is an all time classic, that is up there with the ultimate Metal albums, like Judas Priest's "Painkiller" (my all time favorite), Iron Maiden's "The Number of the Beast", Slayer's "Reign in Blood", & Jag Panzer's "Ample Destruction" (which probably only very few know - just read my review and you'll know why I choose it), to name a few. Musically this album is virtually flawless, my only objection in this category is that there are some very minor flaws, like the beginning riff of "Battery", which really comes across as a jumbled - thrown together effort, but the last 3rd of the riffs are certainly excellent. The only other trouble for me is "The Thing that should not Be", sounds to me, as only German Metal Mag put it, like "The Song that should not Be". And it was, hence, no real surprise for me to find out that this was the last song that Metallica recorded for "Master of Puppets", they were seriously improvising by then, running out of song material. Having said all that, there is only one final (and the most serious) flaw to this album to be considered, and that is simply the production (overall sound). This is absolutely substandard to put it leniently. Sure this album was recorded in 1986, but I have many albums that were even recorded in the early 80s that sound far better that this. The sound is far to muffled, especially the guitar and even more so the bass are way too much in the background and generally stifled. It is obvious that a remastering task is badly required for this timeless classic to be restored to the status that it deserves sound wise. If you don't believe me, just do the following after playing this (or before for that matter) put on "Ride the Lightning" (from 1984), and you'll immediately hear that the difference is almost as acute as day and night, since "Ride the Lightning" has a crisp, crystal clear and dynamic sound to it. I just don't understand why a band like Metallica, which is the most popular Metal band in the world, having sold 80 to 90 million copies of their albums, apparently never considered remastering all their 80s albums. As one reviewer put it so aptly, they should remaster all those 80s albums, as well as the "Metallica" (Black Album) from 1991. But coming back to "Master of Puppets" this one is the worst produced of all Metallica albums with the possible exception of "St. Anger", but then again here the band wanted to have an "underground" like sound, for credibility purpose. Battery: Great. Starts out pretty mellow, but gets heavier and proceeds to beat you into submission. Master of Puppets: Great. Starts out heavy, then gets kinda' funky in the middle, and just when you think it's over, it punches you in the face and keeps marching. The Thing The Should Not Be: Crap. This should be called The Song the Should Not Be. Welcome Home(Sanitarium): Great. Pretty mellow, but like the mental patients it's about, it rises, stronger and stronger. The "Master" of all Metal albums! (Period). Why is This So Loved? Battery, the title song, and Orion are almost the only reason to own this album. The rest of the music on here is heavy and dark, but it just shuffles onward like the soldiers depicted in Disposable Heroes, until eventually the album dies with Damage, Inc.
And this is Metallica's most popular thrash album. They reached their peak on Ride the Lightning, with a little boost for this album's follow-up, but here they fell well short of writing engaging music. Most of this fails to thrash like RTL did, and only comes close to matching the darkness and gloom of ...And Justice for All. I suppose one thing this album has going for it is the bass. But that's not enough. Battery starts out the album good, giving the listener high expectations for what's to come. Master of Puppets takes you even higher, being a much better song. Orion is their best instrumental, and probably Metallica's most melodic song. The solos and riffs in this one beat anything else this album has to offer. Sure Disposable Heroes is fast and thrashy but it has too few ideas for too long a length. I wasn't interested in it for eight full minutes. The rest is rather boring.